This rental price is for up to 4 hours. Anything over, please call us for a custom quote. This booth does NOT come with an attendant. It is always recommended you add an event staff member to make your event run as smoothly as possible. These are $10 per hour and can be found under event staff. 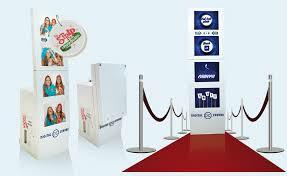 The Strip PhotoBooth can fit anywhere from 1 to 50 people including customizable screens and strips with the event image. This PhotoBooth allows sharing photos and video messages via social networks. Its ultra-portability makes for easy setup. I agree there are no steps/stairs that you must use for the setup. Additional Fees will apply if so. I understand that the lighting can effect how the mirror works. The attendant will do everything in their power to adjust the settings but Kids Bouncy Things cannot promise perfect photos if lighting changes at anytime during the event.